Coffee table books. We’re familiar with them; big and bulky, full of images. Not your regular book. I have a few myself that showcase a variety of random interests from famous artwork, to photographs of renowned landscapes – typical cliche coffee table books. Not much thought was put into their placement in my living room. But I digress. Several years ago, while taking an undergraduate course entitled “Fascism on Film,” I was first introduced to Leni Riefenstahl when our professor screened Triumph of the Will (1935). What followed was a fascination with a woman who appeared to me as someone who lived an extraordinary life. The accomplished dancer and actress-turned-filmmaker pursued underwater photography at age 72 (the oldest known scuba diver until her death). She went to Las Vegas to photograph Sigfried and Roy. On her 100th birthday she released a film, Underwater Impressions and in 2003, at the age of 101, she married her partner Horst Kettner (he was 40 years younger than her). I was enthralled by her life and decided that I needed to know more. I picked up her autobiography, a few biographies and did some online research. Throughout this process it became clear that she possessed a darker side that – despite her fame and success as an artist – shrouded both her reputation and work. What follows are my reflections on her photographic book, Die Nuba. Die Nuba (1973) was first published in English as The Last of the Nuba in 1974. 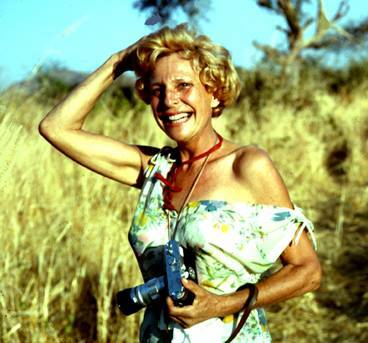 Riefenstahl, who was granted special permission by the Sudanese government to live and document indigenous peoples living within Sudan, conducted her photography in the early 1970s. Riefenstahl was a renowned German filmmaker, director, actress and photographer. She was known primarily for her work directing propagandist films for the Nazi regime. She held prominence within the Nazi party and maintained a close friendship with Adolf Hitler. Following the Second World War she was arrested and acquitted. Despite being hailed as a gifted artist, her involvement and acceptance of fascist ideology, along with her relationship with Hitler, has always been questioned. The image on the right is of an unidentified “Nuba” woman. I chose to put Nuba in quotation marks because I use it lightly. To Westerners “Nuba” is used to identify indigenous peoples that inhabit the Nuba Mountains in Southern Sudan, Africa. Are they African? Sudanese? What would they call themselves? Interesting but moving on. Riefenstahl’s choice of photographic subject—this tribe and not another—expresses a very particular slant. She interprets the Nuba as a mystical people with an extraordinarily developed artistic sense (one of the few possessions which everyone owns is a lyre). 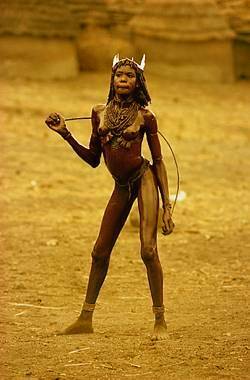 They are all beautiful (Nuba men, Riefenstahl notes, “have an athletic build rare in any other African tribe”); although they have to work hard to survive in the unhospitable desert (they are cattle herders and hunters), she insists that their principal activity is ceremonial. The Last of the Nuba is about a primitivist ideal: a portrait of a people subsisting untouched by “civilization,” in a pure harmony with their environment. She condemns Riefenstahl for continuing to document and practice Nazi aesthetics. For Sontag, Riefenstahl’s work on the Nuba is not an attempt to redefine herself as a photographer/artist, and it is not a product of her artistic rehabilitation, but a continuation of past work – fascist propaganda that appeared in commissioned films such as Triumph of the Will (1935) and Olympia (1938). The Last of the Nuba, an elegy for the soon-to-be-extinguished beauty and mystic powers of primitives, can be seen as the third in Riefenstahl’s triptych of fascist visuals. What Sontag is referring to are two of Riefenstahl’s renowned propagandist films (mentioned previously), and cites the coffee-table book as “the third in [her] triptych of fascist visuals.” And I agree with Sontag; here again is a violent celebration and aestheticization (idealization) of the human body. Although the Nuba are not Aryan, their bodies are aesthetetized and visually categorized along the fascist ideals of purity (versus impurity), athleticism (versus unfit), and community (versus individualism) etc. Their bodies are also sexualized as the ideal African body; they are untouched by war, politics, technology, modernism, and colonization (for the time being anyways). Within these images we have contrasting notions of a vanishing people, the noble savage, and the ideal fascist body. But here lies the paradox of Riefenstahl’s work; the simple act of photographing and fostering a culture of consumerism and voyeurism around these images contradicts their creation. Their circulation as a commodity (as a coffee table book) ironically displays the culture of the Nuba, their bodies, their way of life within the public sphere. As a result, they become a spectacle to Western society. They are on display. That being said, I feel uncomfortable re-circulating the image of the woman in this article. Her body as well as her identity is literally owned within the frame of Riefenstahl’s images. Now I do not want to suggest that the Nuba were solely acted upon. I am not sure how much they negotiated and participated in the documentation of their culture. This is a whole other can of worms, and I don’t have time to get into this here. Back to my discussion of the coffee table book in the introduction. The Last of the Nuba was designed as coffee table book when it was first published. It was meant to sit nicely on a coffee table as an accessory in the home, to showcase a wordly and avant-garde lifestyle. By owning The Last of the Nuba does one own the last of the Nuba? Does one own a little slice of unspoiled African civilization? Is this more than a coffee table book? I would say, yes. The idea of the coffee table book as “the personal becoming political” appears in Finis Dunaway’s chapter in Natural Visions, “Nature on the Coffee Table.” Dunaway argues that by creating, exhibiting, and later circulating images of supposed endangered American landscapes, the Sierra Club advanced their environmentalist agenda and altered ways of understanding place and placelessness. Their coffee table books also shaped public memory of the American landscape. The same can be said for The Last of the Nuba. Original publications of Die Nuba / The Last of the Nuba are a hot commodity (they go for at least a few hundred dollars at auction) and after Riefenstahl’s death in 2003, The Last of the Nuba became more desirable. People are buying into the notion that these books are disappearing and that it might be valuable to own a copy. Wait a second, what about the Nuba? Did we forget about them? How did they fare? That being said, it’s important to keep in mind that the context of display of The Last of the Nuba as a coffee table book, is a subtle continuation of fascist and colonial aesthetics. I have not looked through Die Nuba, but thanks for the review, it sounds intriguing if only for browsing some nice photos. Until then, consider this: would all academics who criticize colonialism these days have felt the same had they lived at the height of colonialism. After all, these darn Westerners live quite comfortably now BECAUSE OF colonialism. Would they give this comfort up? Greatly doubt it. Same with the environmentalists etc. etc.